Every tribe is unique, and we want to know what makes your tribe tick. 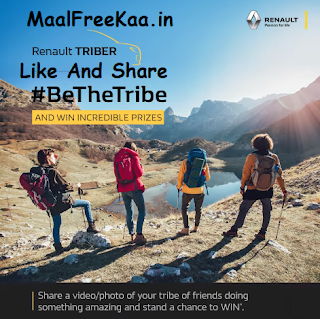 Singing, dancing, or surfing – comment below with the coolest photos/videos of your friends doing what they do best, tag them all and use Be The Tribe & Renault TRIBER. Amazon vouchers up to ₹ 1.80 lakh* are up for grabs! Show us what makes your tribe tick. Singing, dancing, or surfing the coolest photos/videos of your friends doing what they do best, tag them all participants will have to share photos/videos of their group of friends doing something unique or interesting. 1. ‘Follow’ Renault India on Twitter or ‘Like’ the Renault India page on Facebook or ‘Follow’ @RenaultIndia on Instagram. 2. Participants have to tag all their friends, @RenaultIndia, and use the hashtags #BeTheTribe and #RenaultTRIBER in each entry. They also have to get the maximum likes/retweets on their tweet (Twitter), post (Instagram) or comment (Facebook) to be eligible to win. Prize You Win Free There will be 10 winners.